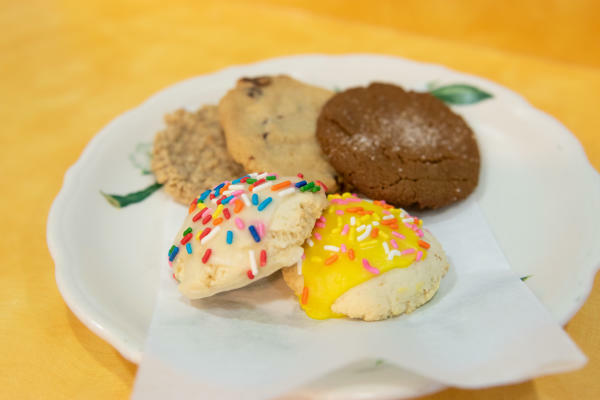 A lunchtime favorite of mine are the cookies from Lindi&apos;s! For balance, I order the salad bar, and, of course, a chocolate chip cookie. These cookies are by far one of my favorite. They have the best mix of perfectly soft centers, crunchy edges, and a sweet vanilla-like flavor. I could eat them every day! From delectable oatmeal chocolate chip cookies, double chocolate chip, and snickerdoodles to specialty favorites like double chocolate chip mint, Cookie Cottage is a cookie lover&apos;s heaven! In their new location, pick out a dozen or two. The only hard part is deciding what flavors! 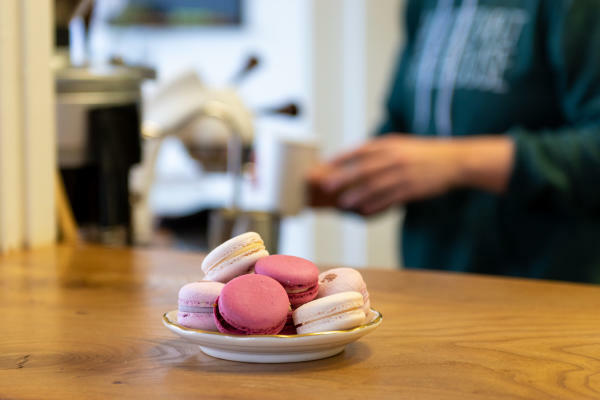 Conjure coffee may not have cookies always available on their menu, but their macarons are some of the best in the city! These sweet morsels of cookies are soft in the center and they come in a variety of delectable flavors like raspberry chocolate from Hetty Arts Pastry! Cookies for dessert, yes, please! 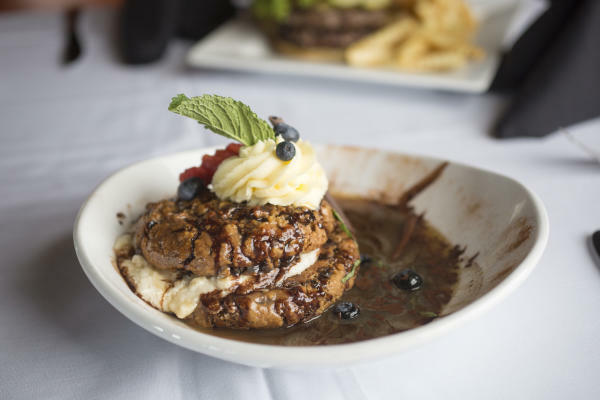 At Club Soda, make sure you save room the oatmeal raisin cookie sandwich. Although oatmeal raisin is not my go-to cookie, this dessert is amazing. Two cookies sandwiching vanilla cream, and all covered in delectable chocolate sauce. The Fort Wayne International Airport wins the best hospitality for their sweet "Welcome Home" cookies. 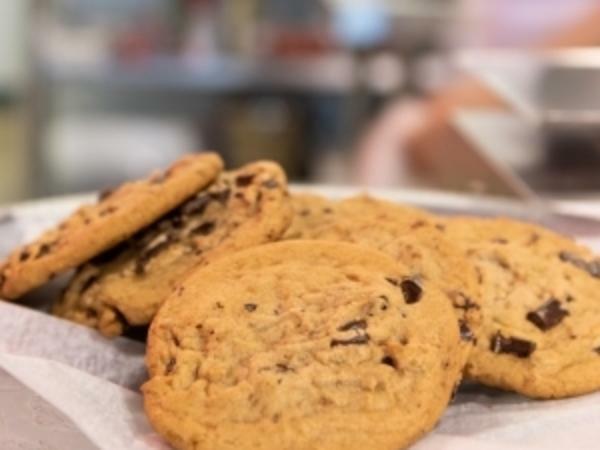 From getting home on a late night flight or being welcomed by their greeters, make sure you don&apos;t miss the opportunity to snag one of these cookies on your way to baggage claim! Don Hall&apos;s Takes the Cakes is a Fort Wayne classic for cakes. They have some of the best German Chocolate Cakes, but they also make some great cookies that you can even personalize. 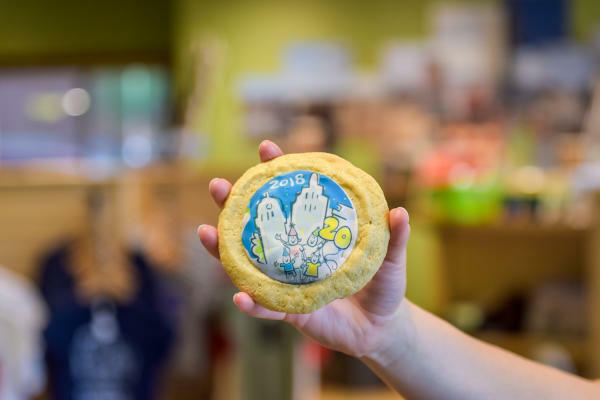 During Be A Tourist in Your Own Hometown this past September, the Fort Wayne Visitors Center celebrated the 20th Anniversary of the event by providing free frosted sugar cookies from Hall&apos;s Takes the Cake, and they were the perfect addition! Located on Broadway in Downtown Fort Wayne, Sassie Cakes is a great specialty bakery that offers a variety of baked goods like cupcakes, cakes, custom cookie shapes, and edible cookie dough! Order one scoop or a couple scoops in a cup or a cone, and you can safely enjoy the best part of baking cookies without all of the mess. Flavors change daily, which is all the more reason to come back. Now, these cookie destinations are not on the honorable mentions because they&apos;re less than any prior cookies mentioned, but because I have not had a chance to properly try these cookies. They&apos;re still all worthy of National Cookie Day though! For vegan cookies and treats, Pembroke Bakery has some great options including some amazing cupcakes and cinnamon rolls. Pembroke also has the cookies, which can make the perfect treat on the go as you explore downtown Fort Wayne. If you&apos;re north of downtown Fort Wayne, make a stop in at Courtney&apos;s Bakery on Coldwater Road. Courtney&apos;s has some of the best cakes and cupcakes in town, but they also tout cookies and macarons on their menu! If you&apos;re along State Street, Zinnia&apos;s Bakehouse is the perfect stop for a sweet treat. From muffins, cakes, and beignets on Saturdays, Zinnia&apos;s has a lot to offer!